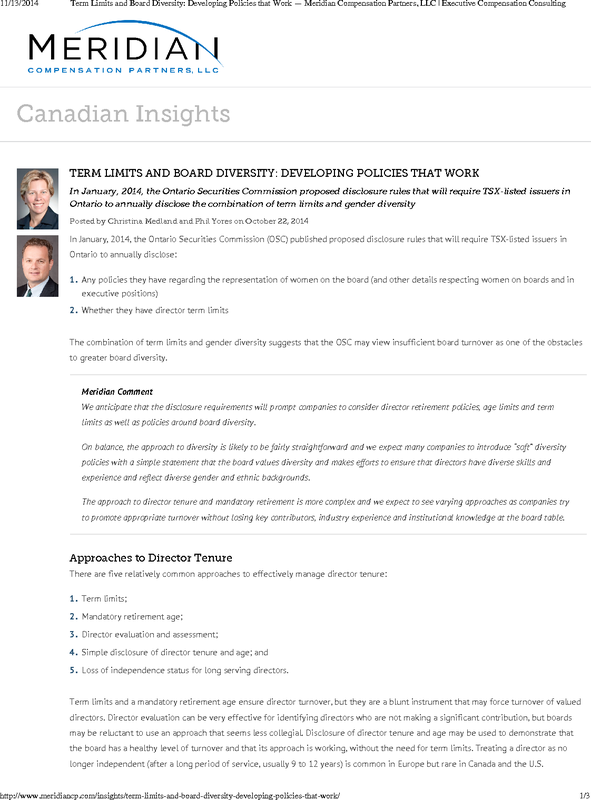 The combination of term limits and gender diversity suggests that the OSC may view insufficient board turnover as one of the obstacles to greater board diversity. Meridian comment. We anticipate that the disclosure requirements will prompt companies to consider director retirement policies, age limits and term limits as well as policies around board diversity.On balance, the approach to diversity is likely to be fairly straightforward and we expect many companies to introduce “soft” diversity policies with a simple statement that the board values diversity and makes efforts to ensure that directors have diverse skills and experience and reflect diverse gender and ethnic backgrounds. The approach to director tenure and mandatory retirement is more complex and we expect to see varying approaches as companies try to promote appropriate turnover without losing key contributors, industry experience and institutional knowledge at the board table. Loss of independence status for long serving directors. Term limits and a mandatory retirement age ensure director turnover, but they are a blunt instrument that may force turnover of valued directors. Director evaluation can be very effective for identifying directors who are not making a significant contribution, but boards may be reluctant to use an approach that seems less collegial. Disclosure of director tenure and age may be used to demonstrate that the board has a healthy level of turnover and that its approach is working, without the need for term limits. Treating a director as no longer independent (after a long period of service, usually 9 to 12 years) is common in Europe but rare in Canada and the U.S. While the “comply or explain” model prevails worldwide, there seems to be a link between shorter director tenure and term limits or loss of independent status. Studies of ideal director tenure are contradictory, some demonstrating significant benefits, while others highlight the detriments of longer-serving directors. However, there is a fairly common view that too little and too much director turnover are both correlated with low corporate performance and that reasonable director turnover is correlated with higher corporate performance. Mandatory retirement ages (e.g., a director cannot stand for re-election after reaching age 72) enable board members to “retire” with dignity. Meridian comment. 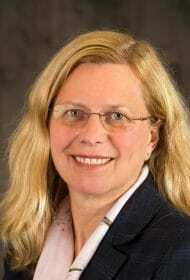 Rigid rules like term limits or mandatory retirement ages are often viewed as too limiting to boards trying to ensure their membership is comprised of a diverse group of directors with both long- and short-tenures, rather than being viewed as a useful tool that can help facilitate a refresh process among board members. Retaining some flexibility to apply their professional judgment, coupled with a strong board evaluation process will give boards the ability to ensure that they attract and retain the directors they need to support the long-term business strategy.